Sara Lamneck ‘18L, is from Swoope, Virginia. She received her bachelor’s degree from Eastern Mennonite University. 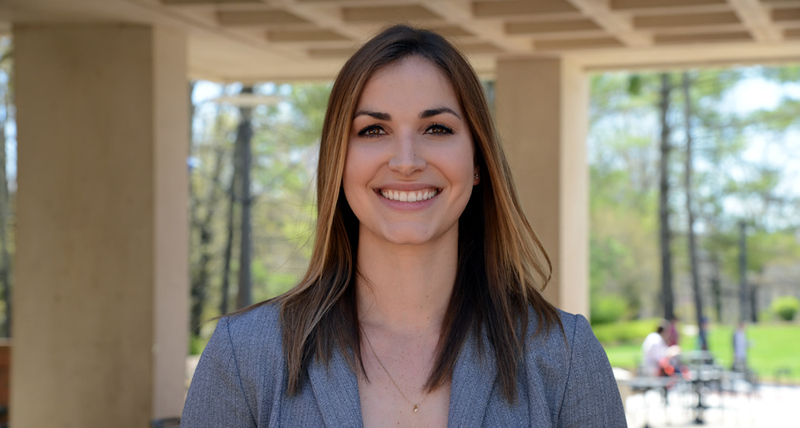 While at W&L, she was a Law Ambassador and participated in internal and external moot court competitions. After graduation, Sara will enter the Army JAG Corps. Why did you decide to pursue a career in JAG? Have you had any externships or experiences at law school that pointed you in that direction? At the beginning of my law school career, I thought I might be interested in joining the JAG Corps. My father served in the Air Force, and I have other family members who have also served, so I was familiar with the military. Even though the Army did not have a formal 1L internship program, I wanted to extern with them to confirm that it was the path I wanted to pursue after graduation. Between participating in PT, conducting legal research, and assisting trial counsel, I really enjoyed my 1L summer at Fort Campbell. Professor MacDonnell has also been influential and extremely helpful in this process. He spoke to the Judge Advocate Recruiting Office and officers at Fort Campbell on my behalf and has always been willing to answer any questions I have had throughout this process. Describe the application and interview process for JAG. What was most interesting or surprising about that experience? The application and interview process was more thorough than expected. The application took a significant amount of time to complete. Multiple people also told me that the interview with the Field Screening Officer was the most important part of the application so I needed to take it seriously. I was most surprised that the interview was not as formal and rigid as I was expecting. The FSO was very cordial and asked a lot of questions, but he also wanted to make sure all of my questions and concerns were addressed too. Do you know where you will be placed and what sort of work you will be doing? If not, what do you hope for? I will not find out where I will be placed until later on in the process. I hope to be placed at a bigger installation so that I have the opportunity to see and interact with a wider variety of issues. Generally, most JAG officers get the opportunity to work in legal assistance, admin law, operational law, and military justice. During my externship, I really enjoyed working in legal assistance and military justice. In what ways has your experience at W&L Law prepared you for JAG? W&L has a great legal research program that has helped me prepare for my legal career. Having the opportunity to work collaboratively with my peers and also participating in moot court activities has helped me become more comfortable and confident in speaking in front of others, which will be invaluable as a JAG officer.